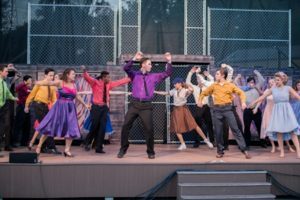 Thank God for the resilience of youth amid sweltering heat and humidity as the mostly teenage cast of Leawood Stage’s free summer production of “West Side Story” opened on Friday, July 13, at the amphitheater at Ironwoods Park Amphitheater. 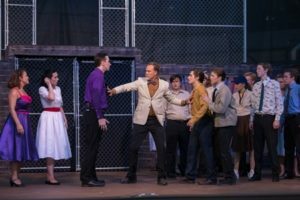 Community theater continues at Leawood Stage Company with an enormous outpouring of young talent on stage and a mixture of young and mature in the orchestra as they present the Broadway classic, “West Side Story,” in the middle of an excessive heat wave in Kansas City. 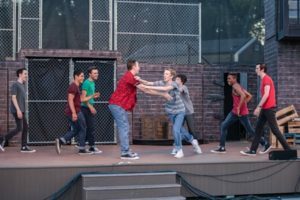 With daily temperatures hovering around 100F, this dedicated troupe of players bravely sweat through the opening night performance with nary a breeze throughout the entire show. 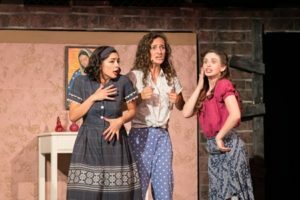 Give lots of credit to Leawood Stage for undertaking such a difficult and dance heavy show that updates the Shakespeare cassic, Romeo and Juliet, by setting in a New York neighborhood full of immigrants, European and Latin. This particular story pits a white American-born second generation against the newly immigrated Puerto Rican population. Summer, territory wars, anti-Latin prejudice, teenage angst, and police prejudice all combine to stir the pot–and in this case with deadly consequences. Amazing how art imitates life and visa-versa. 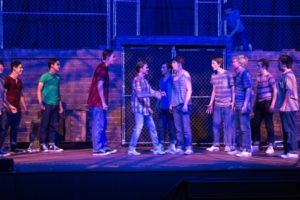 “West Side Story” tells the story of anger, competition and mistrust of first and second generations, both immigrant populations, in a city. The established immigrants fear the new immigrants from Puerto Rico will take their jobs. The new Puerto Ricans understand that the second generation immigrants, born here, have a better chance of success than they do. Though this was not meant to be a political story, it seems the battles of the 1950s remains in place today with people on both sides of the immigration policies of the US Government. How sad that this continues today. Leawood State created some nice technical aspects for this show, including a changeable set to reflect the different locations of the story. The lighting was really well done, especially in an outside venue where the setting sun can create problems in the first act. Costumes, for the most part, are realistic. My main conflict was having a member of the Sharks in a non-matching color scheme. In this production the Sharks were all in red–except one. That was confusing. The Jets were mostly clad in shades of blue, but agin one stood out in aqua. It broke the continuity of the two opposing groups. That does not change the quality of the show or the acting, just a confusing piece for the audience who may not know the names of the characters and to which group the off-color person belongs. A major problem on opening night was pitch. One of the technical pieces that can and will be corrected was that the actors could not see the monitor or hear their pitch, so they had to just guess which note to start their songs. For Maria, this was not the problem, but most others obviously could not hear the orchestration and make proper adjustments. Act II corrected most of this issue. 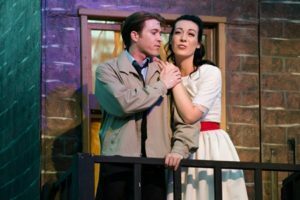 With a “dance” show, getting non-dancing actors to dance always presents a challenge for the choreographer. And the actors did a nice job of delivering the dance steps in a limited choreographed production. 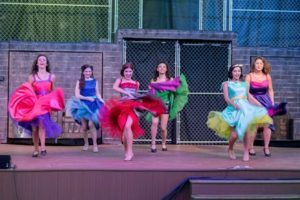 An equity-based company would have a plethora of dancing actors to play the parts; a community theatre takes beginners and elevates them to performers. Good job on doing that. As for the acting, the strongest performances came from Jennifer Covillle as Anita and Lisa Earlenbaugh, as Maria. Both gave strong performances throughout both acts. Others that was convincing were Mike Forsythe as Doc, Caleb Ellis as Riff, Cameron Mabie as Action. Because of the story/script, several characters do not get a lot of opportunity to stand out. That is the nature of this show. Musically, the best and most fun number in the show was the “Officer Krupke” number. The men in that particular song elevated Act II to a different level. The song is a comedy number and the men doing seemed energized and ready for the comic relief. 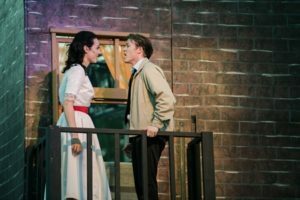 Overall, “West Side Story” is an extremely entertaining story. How can you beat a Shakespeare story for tragedy? And, this, even though called musical-comedy is a tragedy. The music, well-known, will always lift the show. Such unforgettable songs as “Maria,” “Tonight,” and “Somewhere” have gained stature as American classics, still performed and known today. 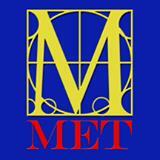 Although a Broadway success originally and in revivals, the show remains awkward to produce in live format. The movie version took liberty and smoothed out the awkwardness of the stage version. Still, the live, stage version continues to draw audiences. The story, the music, the lyrics, the conflict all deserve to be seen and heard. 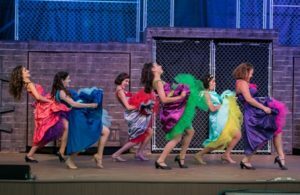 “West Side Story” is family-friendly, but probably pre-teens will be lost in the story-line. Younger audience members may enjoy the music, but in the current heat, even the best young ones can get grouchy and tired. No need for parental guidance. The show does not contain profanity or depict anything offensive. So, go and enjoy the show–and the heat both on stage and off. as Chino, Camille Breckenridge as Consuelo, Sabrina Stewart as Francisca, Rosalia Miguel Hunt as Shark, Ryan Foster as Shark, Luke Martin as Shark, Benjamin Priestland as Shark, Terrace Wyatt as Shark, Sarah Navran as Sharkette, Zoe Lepper as Sharkette, Elise Bowles as Sharkette. Adults: Chris Pierce as Officer Krupke, Edward Hingnla as Schrank, Mike Forsythe as Doc, Brian Hill as Glad Hand. 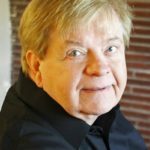 Creative Team: Director, Eric Van Horn; Music Director, Tim Braselton; Choreographer, Kristin Seefeldt; Stage Manager, Alexa Edmonds; Costumer, Annette Cook. 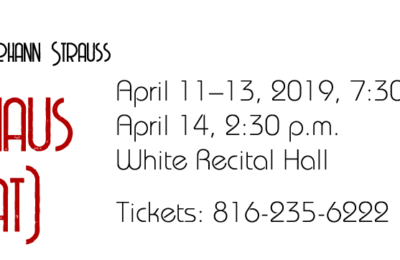 The West Side Story Orchestra: Conductor, Kenneth Tysick; Violin A, Tosh Watanabe; Violin C, Laura Gray; Violin B, Kathy Doerfler; Cello, Kathleen Crilley; Bass, Liz Karre; Alto/Clarinet, Debbie Allen; Flute/Piccolo, Jerilyn Main; Clarinet, Holly Hague; Flute, Laura Newport; Flute/Piccolo, Ashleigh Tysik; Baritone/Alto/Tenor Sax, Amanda Personett; Bassoon, LIsan glandOboe/English Horn, Amy Schwartz; Clarinet, Johnathan McHenry; Trumpet, Michael Marsh; Trumpet, Dylan Stiles; Trumpet, Brad Footh; Trumpet,Andrew Beckstrom; Trombone, Dave Lovetere; Trombone, Steven Constance; Trombone, Ken Tysick; Percussion, Bill Brune; Percussion, Brett Butler; Percussion, Zac Keyser; Set, Eric Powers; Harp, Lisa Watkins. 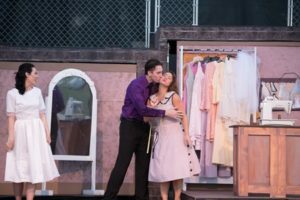 Performance Dates at 8 p.m. at the Ironwoods Park Amphitheater: Friday, July 13, Saturday, July 14, Sunday, July 15, Thursday, July 19, Friday, July 20, Saturday, July 21. Admission is free. Concessions available at the site.